Earn 205 - 521 points upon purchasing this product. Use 2050 - 5210 points to purchase this product! 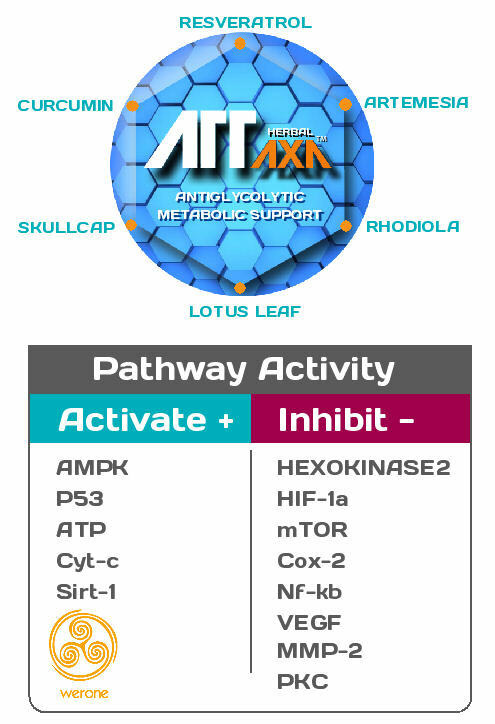 ATTaxa is a complex of 6 powerful extracts which may help reduce glycolysis by increasing AMPK pathway, reducing Hexokinase 2, VEGF and HIF-1a pathways whilst enhancing tumor suppressor pathways such as P53 & IRT1. 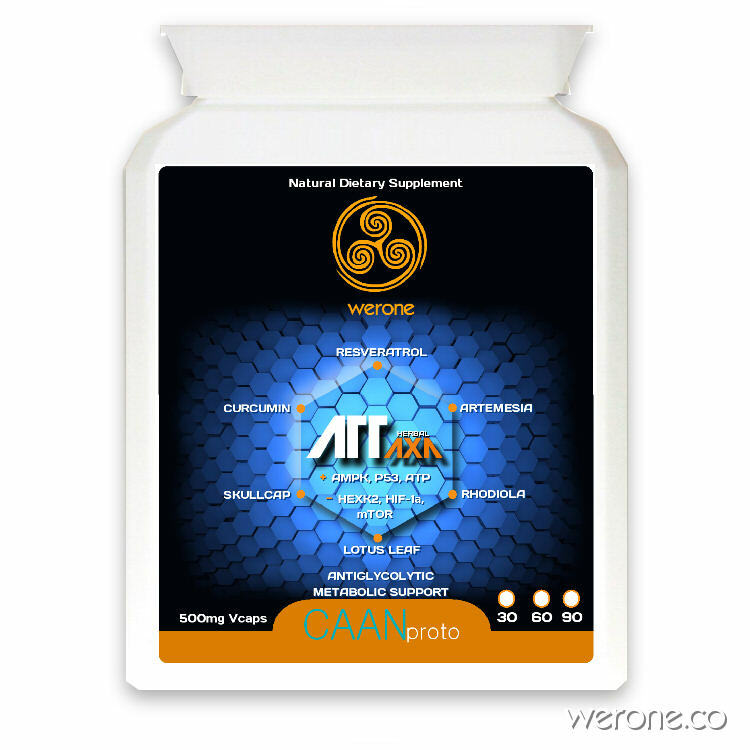 ATT stands for Antiglycolytic Tumor Therapy and may offer support for restoration of optimal metabolic functions to cells which have compromised respiration. HK2 is highly expressed in several cancers, including breast cancer and colon cancer. Its role in coupling ATP from oxidative phosphorylation to the rate-limiting step of glycolysis may help drive the tumor cells’ growth. Notably, inhibition of HK2 has demonstrably improved the effectiveness of anticancer drugs. Thus, HK2 stands as a promising therapeutic target, though considering its ubiquitous expression and crucial role in energy metabolism, a reduction rather than complete inhibition of its activity should be pursued. Positron emission tomography [PET] scanning with the radiotracer is widely used in tumor imaging for clinical studies or diagnosis. This radiotracer is derived from glucose, taken up by glucose-consuming cells and phosphorylated by mitochondrial hexokinase 2, which is greatly elevated in rapidly growing malignant tumors. During the process of tumor cell proliferation, insufficient supply of oxygen results in hypoxia. Hypoxic areas of tumors, high in HIF-1a are relatively insensitive to chemotherapy and radiation therapy. Now, in clinics worldwide this prominent phenotype forms the basis of one of the most common detection systems for cancer, Significantly, HK-2 is the major bound hexokinase isoform expressed in cancers that exhibit a “Warburg effect”. This includes most cancers that metastasize and kill their human host. By stationing itself on the outer mitochondrial membrane, HK-2 also helps immortalize cancer cells, escapes product inhibition and gains preferential access to newly synthesized ATP for phosphorylating glucose. The latter event traps this essential nutrient inside the tumor cells as glucose-6-P, some of which is funneled off to serve as carbon precursors to help promote the production of new cancer cells while much is converted to lactic acid that exits the cells. The resultant acidity likely wards off an immune response while preparing surrounding tissues for invasion. With the re-emergence and acceptance of both the “Warburg effect” as a prominent phenotype of most clinical cancers, and “metabolic targeting” as a rational therapeutic strategy, a number of laboratories are focusing on metabolite entry or exit steps. also has relevance for those developing a Longevity regime as the supplement contains active components which may influence AMPK, SIRT 1-3 and thus mTOR in the right direction for autophagy. Such approaches can be combined with Triphalash which contains Ashwagandha and Brahmi, both potent adaptogens known to activate the Nrf2 pathway. What is Attaxa Made From? a-Curcumene is one of the physiologically active components of Curcuma zedoaria, which is believed to perform anti-tumor activities. Curcumin has been found to induce dissociation of HK2 from the mitochondria, resulting in mitochondrial-mediated apoptosis. Furthermore, the phosphorylation of mitochondrial HK2 through AKT has also be found responsible for the curcumin-induced dissociation of HK2, which was different from the mechanism of HK2 inhibitor 3-BP currently being trialled. Mitochondrial cytochrome c activation and an in vitro caspase-3 activity assay demonstrated that the activation of caspases accompanies the apoptotic effect of a-curcumene, which mediates cell death. These results suggest that the apoptotic effect of a-curcumene on SiHa cells may converge caspase-3 activation through the release of mitochondrial cytochrome c. Cucumin has also been found to block HK2 when combined with tamoxifen with TNBC. Oroxylin A is a major active component of the Chinese traditional medicinal plant Scutellaria baicalensis Georgi, which has been reported as a potential anticancer drug. A study in 2013 demonstrated that, Oroxylin A inhibited the glycolysis and the binding of hexokinase II (HK2) with mitochondria in human breast carcinoma cell lines, which was dependent on sirtuin-3 (SIRT3). As a group of compounds, the flavones in Scutellaria Baicalensis are relatively well understood. But how the beneficial flavones found in the roots of the plant — such as wogonin and baicalin — are generated is not understood. Scutellaria root exhibits multiple pharmacological activities, including anti-oxidative, anti-inflammatory, anti-viral and anti-tumor properties. Oroxylin A has been previously demonstrated to be a competitive candidate of novel anticancer drug in several types of cancers. Oroxylin A has multi-mechanism of anticancer, including apoptosis induction, metastasis inhibition, cell-cycle arrest induction, and so on. It has been reported that SIRT3 can regulate HK2 binding with mitochondria. The loss-of-function in SIRT3 results in a damage-permissive and tumorigenic cellular environment. Polygonum cuspidatum contains a compound known as polydatin, or piceid. Benefits associated with polydatin include cardiovascular, neuroprotective, anti-inflammatory, immunoregulatory, antioxidative and antitumor effects, as well as liver and lung protection. Emodin is a Polygonum cuspidatum compound identified as having health benefits. The compound is used to treat constipation and cancer in traditional Chinese medicine. According to a recent review, “Emerging evidence indicates that emodin possesses a wide spectrum of pharmacological properties, including anticancer, hepatoprotective, anti-inflammatory, antioxidant and antimicrobial activities. Emodin has shown an ability to combat Epstein-Barr viral infection. In cultured rat cortical neurons, pretreatment with emodin derived from P. cuspidatum protected against amyloid beta-induced toxicity, leading the researchers to conclude that emodin is a viable candidate for treating Alzheimer’s disease. Other ingredients: HPMC Hypromellose (vegetable capsule), *organic, zero fillers. Take 2-4 capsules with water three times a day. Attaxa ingredients are generally recognised as safe for supplementation. However, please consult your healthcare provider before using Attaxa to check there are no interactions with current medications. Scutellaria Baicelancis has been used to good effect with Cisplatin in Cancer treatments (source).